Welcome to the Dashboard commentaries. This is a selection of the weekly commentaries sent by Simon Berry to the two Project Managers of the scale-up projects in Zambia. The project managers may do their own commentaries or they may send this on to their teams in the field at their discretion. 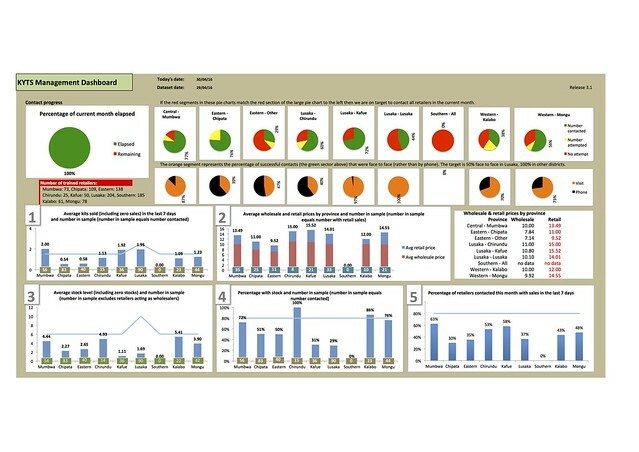 Click on the above image to see the dashboard full-size on Flickr. Charts to monitor the presence of Point of Sale Materials – Posters, Display Trays, Wall Painting (Lusaka only at the moment) – have been added. We have been collecting this information for some time but this is the first time we have analysed it. More realistic targets for stocking levels have been set as they were too high before. They are now set to be twice the target weekly sales. 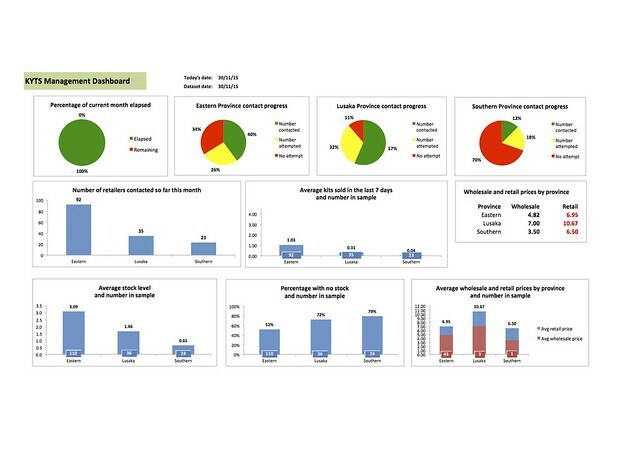 Once again fieldworker performance is generally very good with four districts on target to contact all retailers this month (or 50% in Lusaka). These districts are: Chipata, Lusaka, Chilanga (where all retailers have been visited already), Kalabo and Mongu. It is also impressive to see how many of these contacts are face-to-face. Again these results are impressive with near 100% presence of posters and display trays in all districts except Kafue and Eastern Province. There needs to be a real push on this in Eastern Province and this should start immediately. The same applies to Kafue and in Kalabo for display trays. These point of sale materials are crucial as they in the place where caregivers make decisions on what to buy and have money in their pockets. There appears to be a overall upward trend in sales which is good and expected at this time of the year as diarrhoea incidence increases into October. However, these sales would not be impossible if the retailers had no stock (Graph 4) so the efforts in achieving high stocking levels is really crucial (Graph 4). Although still low, it is pleasing to see sales in Eastern Province increasing quickly. The frequency of face-to-face contact needs to increase in Eastern Province outside Chipata and staff need to carry kits to sell and Point of Sale materials to install. Again prices seem stable at the moment. The lower ex-factory prices will not have filtered through yet. However, I am pleased to report that Pharma Plus in Lusaka are passing on the recent cuts in Pharmanova’s ex-factory prices and have reduced their wholesale price to K47 for 5 kits (K9.40 per kit). Stocking levels seem healthy except in Eastern Province outside Chipata. Once again a key to improving this is more face-to-face contact with retailers here and carrying kits to sell. Things are healthy when the % with stock (Graph 4) is similar to the % with sales (Graph 5). Where the % with sales is greater than the % with stock this indicates strong sales (see Mumbwa and Lusaka) and a failure of retailers to manage their stocks well. Where % with stock is a lot higher than % with sales, more promotion is needed. This needs to be organised by KZF staff AND done by the retailers. In these situations, retailers must be encouraged to draw the attention of people visiting their shop to Kit Yamoyo even when customers come in to buy something else. Promotion needs to be a joint effort. 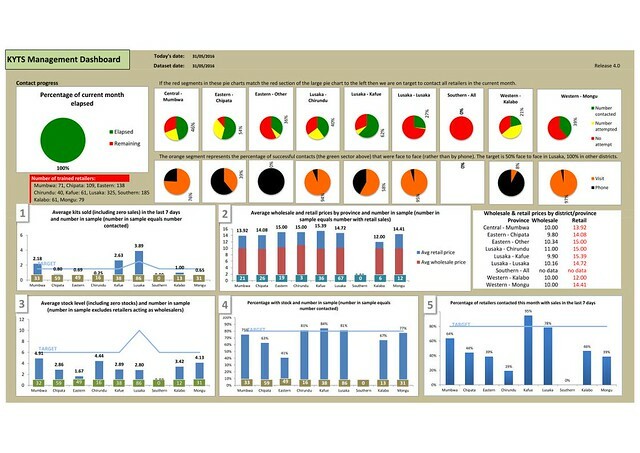 In conclusion, this dashboard indicates that the planning of the support work by KZF staff is much improved and this is reflected in other key indicators and this bodes well as we move into the peak diarrhoea season (October). Eastern Province needs to increase efforts with face-to-face contact with retailers outside Chipata and carry kits, posters and display trays. * Kalabo needs to get display trays out and we need more posters and display trays in Kafue. Once again, this is an impressive achievement but with room for improvement in key areas as outlined above. 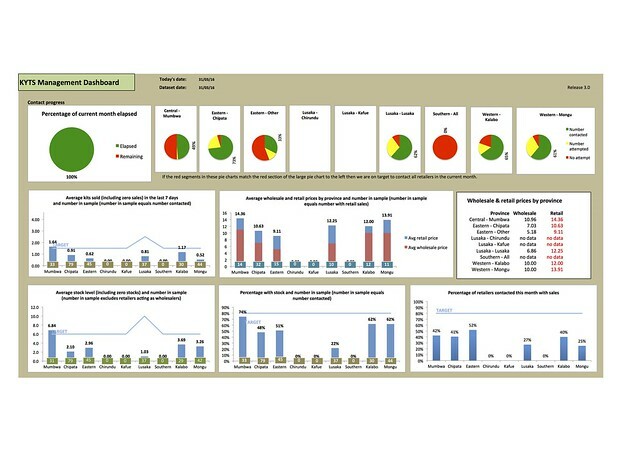 Staff performance in Aug-16, as indicated by the dashboard, is something that we should all be proud of. This level of performance doesn’t just happen and can’t be a achieved by a rush of activity at the end of the month. It requires a plan and a commitment to achieving that plan that starts right at the beginning of the month. This commitment needs to exist at all levels – frontline staff can’t operate without talk-time, fuel, transport etc – so all staff should take pride in this month’s achievements. What has been achieved this month is all the more commendable considering that this was a national election month. That isn’t to say that there is not room for improvement but Aug-16 should be our new benchmark moving forward. If these retailers sell an average 2 kits a week, that’s an additional 664 a month which is likely to save an additional 1 to 2 lives a month. This has never been achieved in a single district before (although Kafue has got close in the past), let alone 3 districts. Although other districts did not reach the target, the performance was improved in all of them except Mumbwa. Sales have increased in most districts this month and in some cases quite dramatically. 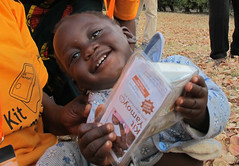 Once again Lusaka exceeded their target of 2.5/week with an average of 2.94. But the sales targets were also smashed in Mumbwa (2.46), Kalabo (2.57) and Mongu (2.75) where the target is 1.5. I think this is consequence of us entering the peak diarrhoea season although we would not see this if we hadn’t been increasing retailer stocking rates steadily over the last nine months through increased face to face visits and the policy of carrying kits to sell during these support visits. These are still high but appear to be stable for now. These are good and virtually unchanged from last month except for Eastern (outside Chipata). This is probably a reflection of the high numbers of retailers contacted in Eastern Province this month. The next graph shows that we contacted retailers who had not been contacted for a long time and had stopped stocking Kit Yamoyo. This is a great demonstration of the importance of regular contacts with retailers. Again these are acceptable except in Eastern (outside Chipata) which is only at 28%. Although this is well below target, it is a great improvement on last month when only 13% had stock. Last month was the first month we saw an increase in contact with Eastern province retailers outside Chipata. I think this demonstrates 2 things: 1) the importance of maintaining regular contact with retailers – without contact they can forget about Kit Yamoyo and stop stocking it and 2) re-establishing contact, re-establishes interest in the product and increases stocking rates AND increases the percentage with sales (this is up from 9% in Jul-16 to 31% with month). I hope to see the trend of increased contact with Eastern Province retailers continue. There is always room for improvement in this area but this has also improved again this month with sales particularly strong in Mumbwa, Lusaka and Kalabo where the % with sales exceeded the % with stock at the time of the visit. This percentage could be further improved by encouraging retailers to do their own in-store promotion of Kit Yamoyo to customers who come buy other things. We also need to ensure all retailers have posters and display trays. Anyway, a great month. This is our new bench mark. Here’s to an even better September! The progress towards the best performing month ever continues. I have high hopes that we will meet retailer contact targets across the board this month (except in Eastern Province outside Chipata where we are not fully funded). And this is happening against the backdrop of the disruption of elections. This improvement in performance of the team comes at a very important time as the peak season for diarrhoea approaches (Sep/Oct/Nov). We are 58% through the month and in 3 districts more than 58% of retailers have been contacted (Chipata, Chirundu and Chilanga). The other districts are very close too: Mongu and Kalabo both stand at 54%, Mumbwa is on 50% and Kafue 42%. Lusaka is on 22% against a target of 29% for this point in the month. Congratulations to Jane for bringing a new district on-board (Chilanga) and carrying out the first visits to retailers since their training last month. With the elections out of the way I am sure we will hit the contact targets in all districts this month for the first time. The sales picture remains encouraging. In particular it’s good to see Eastern Province sales picking up. Sales in Chilanga are also encouraging given that the product is new to this district. Also encouraging are the strong sales in Kalabo and Mongu where they’ve gone from touching the target last month to breaking through it so far this month. Prices seem to have stabilised which is good. Pharmanova are planning a price reduction from 1-Sep so this should help. Please await full details from Pharmanova. As always, we are below target here, but as I’ve said before these targets are probably too high. The most important target is in the next graph – % of retailers with stock. This is a key target that we must try and reach – 80% of retailers with stock. We are close, or over the target in Mumbwa, Chirundu, Kafue and Chilanga. We need to work harder on this key indicator in the other districts. Remember to carry Kit Yamoyo stock with you on all visits. This is especially important at this time of the year as the peak season for diarrhoea approaches (Sep/Oct/Nov). Again this is encouraging and reflects the fact that those with stock are selling. Interestingly, in districts where sales have been particularly strong so far this month this % is higher than the % with stock at the time of the visit. For example, in Mumbwa 84% had stock at the time of the visit but more reported sales in the last 7 days (90%). The same applies for Eastern (outside Chipata), Lusaka, Kalabo and Mongu. Please keep up the excellent work. Let’s make August a record-breaking month as the peak season for diarrhoea approaches. There are several questions in the commentary in red which I would like you to consider and respond to. Throughout the month Kafue has been on target to contact all retailers face-to-face by the end of the month and has virtually achieved this (97% – 103/106). This doesn’t just happen. It requires planning from the very start of the month to achieve this. The other two districts where there is evidence of planning are: Mumbwa and Chirundu. In Mumbwa there were only 3 retailers where no attempt was made to contact and in Chirundu the figure was 6. For several months Lusaka has come close to the 50% contact target but has been training lots of retailers. All districts need to do ‘route plans’ at the start of the month which detail which routes will be taken by KZF staff during the month and which retailers will be visited on those routes. I will communicate further in this and will be available to help make this happen. For your information I have calculated the number of face-to-face visits being achieved per working day and per person per working day. As you can see, there are large discrepancies in contact rate per person between the districts and we need to understand why this is and learn. What are field staff doing differently in Kafue and Lusaka? I would appreciate your comments. These are encouraging and on-target or above target in Mumbwa, Lusaka, Kalabo and Mongu. Chipata sales have increased over the last 3 months despite the competition from Shoprite and the clinics (where the GRZ co-pack is available for free). In Eastern Province outside Chipata, it is worrying that there have been very low sales and most retailers contacted (87%) had zero stock. Why is this? Is there a problem with the wholesalers outside Chipata? These remain below the target everywhere but sales do not seem to be suffering. Perhaps the target is too high. Your comments please? This graph is very impressive (except for Eastern Province outside Chipata as already noted above). Is this a result of field staff carrying Kit Yamoyo with them on visits? I’d like you views on this please. This graph should be compared with Graph 4 and we should be concerned if the percentage with sales (this graph) is a lot lower than the percentage with stock (Graph 4). On this basis the districts of concern are: Chirundu (stock 88%, sales 45%) and Mongu (stock 89%, sales 40%). There needs to be more promotion activity in these districts. All parties need to act here, including the retailers themselves. On future visits to retailers, please encourage retailers to talk about Kit Yamoyo with everyone who visits their shop, even though they may be visiting to buy something else. Awareness of the product is crucial to sales. As always, I will be interested in all feedback and comments. Give Jane a prize! 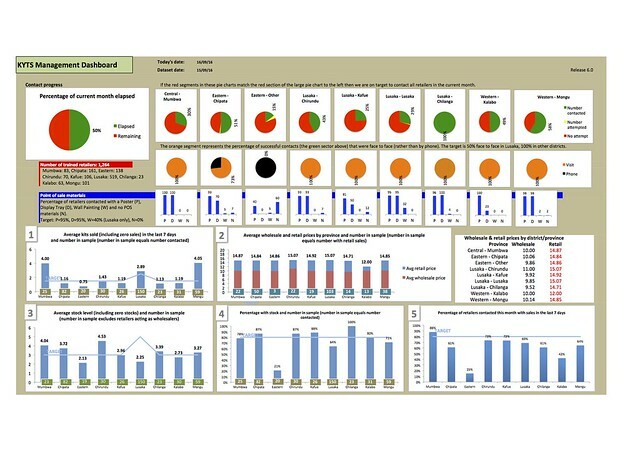 In June Jane contacted 95% of her trained retailers and 100% of these contacts were face to face. 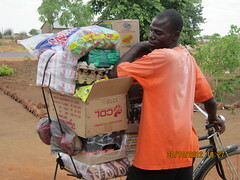 96 retailers visited and this was done from her home in Lusaka using public transport and taxis. It just shows what can be done with commitment and planning. On top of this Jane also recruited 40 more retailers in June. This is exemplary. Although Jane’s performance is exemplary, everybody is generally increasing their performance which is very good to see. 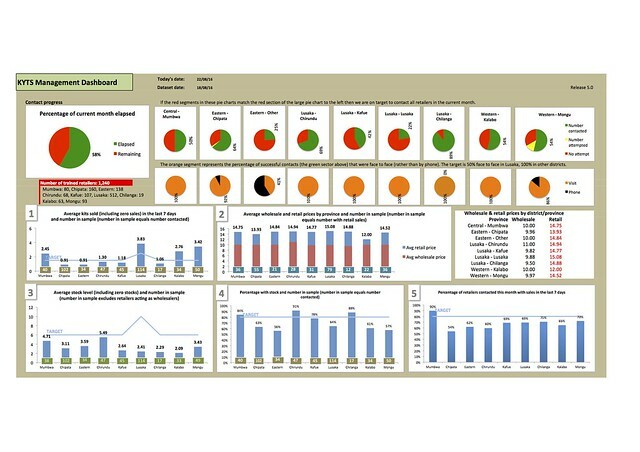 When we first started using the dashboard seriously there was a big leap in performance. We are now seeing steady incremental change but only Kafue has got close to the 100:100 target (100% of retailers contacted, 100% face-to-face) or 100:50 in the case of Lusaka District. This means, to get the next leap in performance, we need to change something. The next step we need to take is ‘route planning’. At the start of the month fieldworkers need to spend some time planning how they are going to contact all their retailers during this month. This will involve sitting down with the list of retailers and deciding which routes to take, on which dates, and which retailers to visit on those routes. Without this planning we are not going to get to the 100:100 position. Without planning, fieldworkers are even likely to forget if a certain retailer has been contacted already this month or not. Route planning (or beat planning as Ralf calls it) is the next transformational step we need to take. If you “fail to plan, you plan to fail”. It is very good to see retailer numbers growing. The dashboard shows 5 more in Mumbwa, 34 more in Chipata, 22 more in Chirundu, 40 more in Kafue, 49 in Lusaka and 2 more in Mongu. These continue to look good with an increase in all districts that are below the target when compared to the end of May-16. These seem to have stabilised or even fallen very slightly which is good. Stock levels are below target in all districts although they are approaching the target in Mumbwa, Mongu and Chirundu. It may be that our target is too high given that despite the low stock levels, the sales (Graph 1) are good. This points to the fact that reducing the numbers of retailers with zero stock is more important that the level of stock itself. So, moving forward, the priority should be on reducing the numbers of retailers with zero stock rather than getting those with stock to increase the stock they have. This is why face-to-face visits, with stock to sell, are so important because it provides the opportunity to correct a zero stock situation. Comparing these graphs you can see that, generally speaking, those with stock are selling. Sales look particularly strong in Lusaka where some retailers had no stock at the time of the visit but had sold in the last 7 days (73% had stock but more (75%) had sold in the last 7 days). So, in conclusion, things are looking good but you (Chibale and Albert) need to implement ‘route planning’ in your teams to get to our 100:100 target. In Chipata all retailers were contacted or an attempt was made to do so – this is the first time a district has achieved this. This is a notable achievement and should recognised. The focus in May should be to visit those who were not contactable by phone in Apr-16. It is also good to see significant activity in Eastern Province (outside Chipata District). Things have kicked off in Chirundu and Kafue which is really good to see and there has been a huge push on the training of retailers in Lusaka (now up to 204, although some 35 of these are inactive and will need to be replaced). 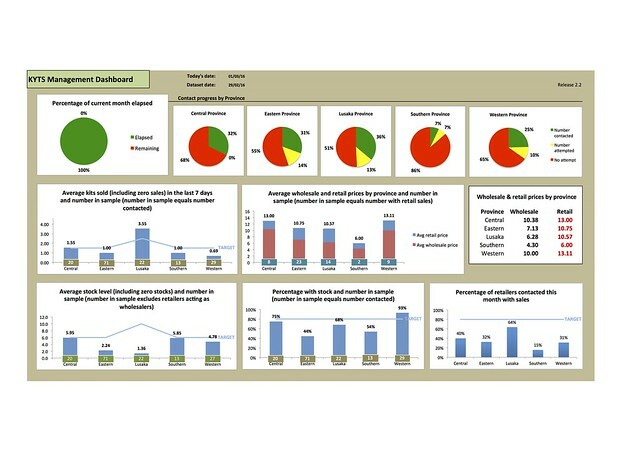 In Kafue 72% of retailers were contacted and 97% of these were through face-to-face visits. This is a very good start in a new district – again, congratulations are in order here. We have never contacted so many retailers in Lusaka in a month before (90) and all these contacts were face-to-face. Again, a great achievement. In Kalabo and Mongu there was an improvement in both the number of retailers contacted and the % of these that were face-to-face. 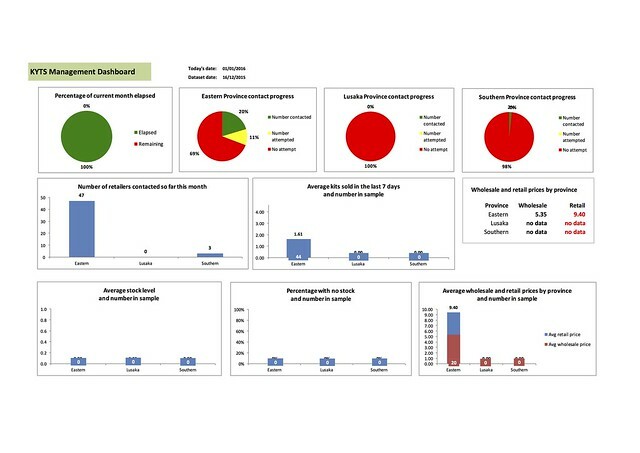 Although not reflected in the dashboard, the underlying data shows multiple contacts with the same retailers in Mongu. Although this is good (eg phone calls to follow-up on action points agreed in face-to-face visits), as much effort now needs to be applied to contacting every retailer at least once in the month. 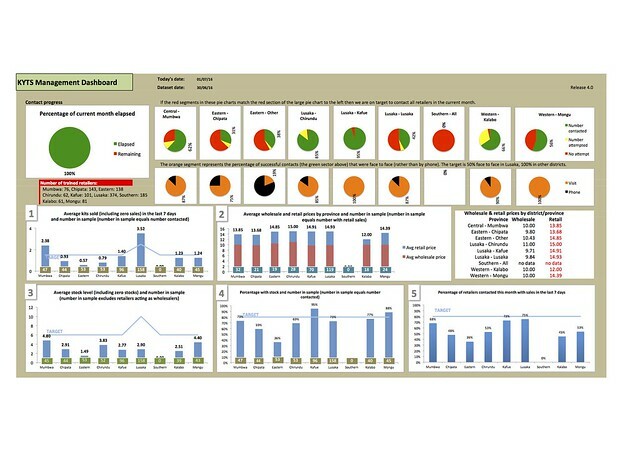 The improvement in face-to-face contact outlined above and the fact that fieldworkers are carrying kits to sell to retailers with low or zero stock is now strongly reflected in the % of retailers with stock (Graph 4) and this in turn has positively effected the % of retailers with sales in the last 7 days before the contact (Graph 5). Generally speaking, those with stock are selling. Weekly sales (Graph 1) are above target or close to our target in all districts except Chipata and the other districts in Eastern Province, indicating that more promotion (including by the retailers themselves to their customers) is needed in Eastern Province. Stock levels (Graph 3) have improved over last month but are generally below our target. To some extent this is a reflection of higher sales. But it is important to keep stock levels up otherwise sales will fall as retailers run out of stock. Prices (Graph 2) are alarmingly high and are even creeping up in Eastern Province where they are still selling the original AidPod format which has a lower ex-factory price. There is not much we can do about this except to encourage some retailers not to take such high margins on the basis that if they reduced prices they would sell more and make more total profit. Margins vary quite a lot from district. However, field workers should not push hard on this, keeping face-to-face contact going with retailers and selling to those with no stock remains the priority. Anyway, all in all very encouraging.